Beautiful flower basket full of fresh roses, carnations, orchids, gypsophila adn greens. There are in all 10 pink colored roses and carnationas each, with 2 stem of blue orchid. You can send this beauitful flower basket to anyone in India and that too on any occasion and festival through RGCards.com. The basket is also adorned with ribbons. 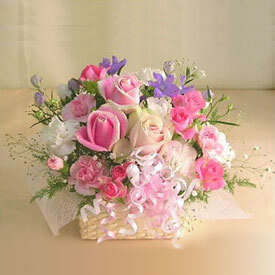 Apart from this flower basket, you can send other Gifts to India.